Each and every Warband is unique it’s organisation and structure, though military based Warbands may share a similar template the inner workings of each differ per the wishes of their leader. What follows is an outline of the structure of the player’s Warband and what each of the ranks means and signifies. Captain – Overall leader of the Warband, it is he who directs its activities and governs its members. Though decisions may be open to debate it is the Captain who has the final say and who must stand by his decision however things pan out. If the Warband is prosperous and successful he will be applauded and commended, if his decisions end badly for the Warband however it is he alone who must take the blame. There is no set way for succession to pass from one captain to the next, some are killed in battle or die from illness, at which point the Commandants and Herald will elect one of their number to be promoted. If the Captain chooses to step down from his role he may choose a successor from among his officers or even a Partisan Superior who is suitably experienced. The most aggressive way the Captaincy can change hands is if the Commandants, Herald and the members of the Partisans feel the Captain has failed so utterly in his role that he must be removed. In these rare cases he will be confronted and asked to step down, if he refuses he will likely be forcibly removed from power and a new captain will then be elected. Herald – The direct second in command of the Warband, the position holds the same respect and power as a Commandant but in addition it is the Herald’s responsibility to see to the organisation and day to day running of the Warband, ensuring that ammunition and fuel are in ready supply, that all trade arrangements are met and that there is ample food for the men and women who serve the Warband. 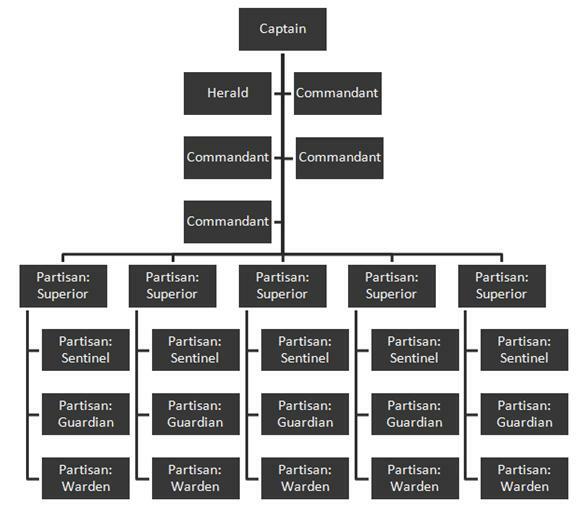 In addition the Herald serves as the Captain’s primary advisor, discussing which direction the Warband would take and offering council on the more difficult decisions inevitably encountered over the Captain’s career. Commandants – Essentially field commanders and strategic advisors to the Captain it is their job to oversee the active operations of the Warband, whether it be procuring treaties, securing trade agreements or fighting off threats. Partisans – The Partisans are the main fighting force of the Warband, formed into fighting squads led by the Superiors. Each squad contains a mix of ranks so that the less experienced members may learn from the veterans of the Warband. There is no set number of members to squad they generally number between 6 and 15 active members, but rarely deploy in larger groups than 10 to allow for rest and recovery from illness or wounds. Depending on the task required of them the Superior of each squad will elect how many warriors to take with him. If strength of arms is required a larger varied force will be taken whereas if the mission is more covert the Superior may choose to only take three of four of the most experienced and dependable members of his squad. Superiors – The leaders of the partisans, each Superior is a veteran of many years having progressed through the ranks before being given command their own squad. Each is a formidable combatant in their own right; kitted out with their own personalised equipment acquired over the course of their career they wield their weapons with absolute ferocity leading the charge against the Warbands enemies. In addition each Superior will have an extensive knowledge of battlefield tactics and operational strategies ensuring they are able to lead their squad most effectively regardless of the situation or what is asked of them. Superiors are always promoted from the squad they will lead as they will already share a close bond with their comrades and will knows the ins and outs of how the squad and its members operate. In addition the rest of the squad will already have great respect for their new commander and this maintains the close ties built up over years of conflict and strengthens the Superior’s authority over those they lead. Sentinels – The elite veteran warriors of the Warband, the Sentinels are the most experienced and adept of all the Partisans. Having served the Warband for many years each has honed his skills over an illustrious career and many life or death combats. Having been a part of the Warband for so long many Sentinels become adept at certain battlefield tactics and choose to take on specialised roles within their squad, favouring a certain load out of equipment on all but the most specialised of missions where their preferred tactics would be of little or no use. Some of these roles include medics, heavy weapon operators, snipers, melee specialists and covert ops. Being the most experienced and knowledgeable of the Partisans, it is from the Sentinels of a squad that a new Superior will be chosen when the old commander retires or is killed in battle. This decision is made by the Commandants but under supervision from the squad members themselves as it is important to choose a strong, popular and knowledgeable leader and not just a warrior who is adept at wielding weapons. Guardians – The Partisan Guardians are seasoned members of the Warband having participated in many excursions and missions. They form the largest portion of the partisans and each and everyone is a strong dependable warrior. Although all Partisans are trained to wield a variety of weapons and equipment by this point in their career many Guardians have begun to favour certain styles and tactics over others, although they still equip themselves according to the requirements of the mission many also elect to carry a favoured weapon regardless of the task at hand, something they can depend on in any unforeseen or extreme circumstances. Wardens – The Wardens are the raw recruits of the Warband who join the Partisans as soon as they’ve completed their basic training and have been fully initiated into the ranks of the Warband. Although many who join the Warband already possess many of the skills required they must all still pass through training to ensure any gaps in their abilities are filled in, this allows the commanders of the Warband to orchestrate missions and give orders without having to consider whether a particular squad is up to the task or not.